Daniel Walsh is cautiously optimistic about Cleveland’s ability to become a more active player in the Midwestern economy. Citymark invests in institutional-quality apartments ranging from 100 to 400 units per property. The company has done about $5 billion worth of deals since it was founded in 2015 and has now launched its second fund. While Walsh has spent most of his career working in Cleveland, his dealmaking activity has largely occurred in other parts of the country. 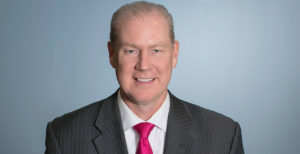 Walsh cut his teeth with KeyBank in the mid-‘90s, building out the company’s real estate investment trust business and raising capital around the world. After a stint with Huntington in a different capacity, Walsh missed making deals and decided to start his own business. Three years later, he’s found his niche. In this Master Dealmakers feature, we spoke with Walsh about his approach to crafting a deal, lessons learned about minimizing mistakes and what Cleveland needs to do to generate more liquidity. The way we do our deals is we buy properties with an operating partner. This is a real secret sauce of our business. It was built when I was at Key, where we had these best-in-class operators in markets who needed capital to buy these properties. One example is a company based in Los Angeles called TruAmerica. They have 40,000 units across the country. We did a deal with them in Orlando. We provide them with a lion’s share of equity and they operate them for us. We have the opportunity to pick deals in markets very flexibly. We don’t have to have a salesperson finding deals for us in those markets. We use our partners’ apparatus as a way to generate deal flow. The overall macroeconomic drivers of the business are very favorable for our strategy. Our typical deal size is about $50 million. The way we would structure it is we would get debt financing for about 70 percent of that. So we get about $35 million of debt, which would leave a $15 million equity need. Our fund will put in 90 percent of the equity. And our operating partner would put in about $1.5 million. When we buy the property, a $50 million deal is roughly 300 units in say Dallas, Texas. When we buy it, it’s usually occupied 95 to 98 percent. We’ll go in and put some money into the units. Once we do that, we can increase the rents. But while we’re doing that, the property is still generating some really good cash flow that we can distribute to our investors. After we fix up the property, after say two or three years, we’ll then sell it at presumably a profit that we distribute to our investors. We just do that over and over again in our funds, generating good returns for our investors. One of the nice things about this is it’s a good recession hedge. These are nice properties. They just aren’t as expensive. You look at a conservative banker like me leaving a job after 20 years to start this, I wanted to make sure there was a long runway ahead for supporting our investment thesis. It’s really important to give a quick no if you don’t think a deal will work. We’ve seen $5 billion in deal flow, 318 deals and we picked six for our first fund. We raised a little over $80 million and we’ve invested all of it and launched our second fund now. Make sure you’re clearly communicating and giving people a quick no. When you have a lot of volume, it’s important to manage your time wisely and focus on deals that work and quickly get out of deals that don’t work. Raising capital is hard. I would imagine that most people in the business world would agree with that. It’s amazing how you never know who is going to invest and who won’t. You just have to stick with it, especially in a fund like ours. As much as you try to apply science to it — and there is some science — leave room for the pleasant surprises by just sticking with articulating your competitive advantage and making sure you’re staying true to that promise. Good things happen. If you try to raise a fund, it’s just a hard thing to do. We’re just lucky we’ve had success. Diagnose why a deal didn’t work and look for patterns. Once those patterns emerge, you can identify that risk as you’re contemplating a new deal. Start from the end and work backward. How do I want this to go and what do I need to make sure I get to that conclusion? I had a couple sayings at Key that I still use. Is it an investment or a gamble? We make investments. We don’t take gambles. If you’re hoping something is going to happen, you are probably making the wrong investment. Pension funds love to buy apartments because there is good cash flow and long-term appreciation. We have a lot of pension funds in Ohio with the Ohio Public Employees Retirement System and State Teachers Retirement System. They buy real estate all over the world and I suspect they own some in Ohio. Then you have large insurance companies like Prudential and New York Life, who also like to own apartments long term, but typically not in the Midwest. One of the only institutional markets in the Midwest is Chicago. You’re seeing some signs of strength in Minneapolis, Columbus and maybe Indianapolis, but I wouldn’t say those are there yet. The third category would be large Wall Street funds like Goldman Sachs, Blackstone or Carlyle. We need a lot better alignment and collaboration with economic development organizations, governmental entities and the business world. You have to get those three groups aligned like we did for the RNC, but do it on a daily basis to make sure we’re creating the very best environment for economic growth. That three-legged stool is critical. There is definitely room for us to improve the collaboration and connectivity between those three groups. It’s about establishing trust, whether it’s business dealings or the economic development we’re trying to create here in Cleveland. When you have a trusting environment, you can do amazingly great things.